We took a day trip up to the Hudson Valley yesterday. It could not have been a more perfect day - driving with Kari, the banter, brunch and then browsing the shops in Cold Spring, relaxing at the dock over the Hudson River, going to the visitor center at West Point Military Academy and finally taking in the performance of The Complete Works of William Shakespeare (Abridged) at Boscobel. My friend Byrne and I were invited to see any of the shows by the Hudson Valley Shakespeare Festival. I love Shakespeare and I knew I wanted to go. Our choices were the Complete Works, Much Ado About Nothing, or Pericles. I couldn't resist seeing the Complete Works this time. The Complete Works was the icing on the cake of a beautiful day. Besides being blown away by the venue, I was not prepared to laugh so much! What began as a lecture on the life of Shakespeare turned into an hysterical and irreverant race through most of his works. 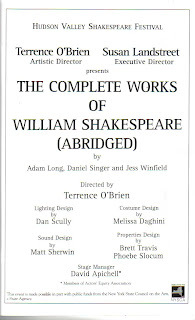 The Complete Works is by Adam Long, Daniel Singer and Jess Winfield. It's a ridiculously funny mix of the original text and modern day pop culture, with the craziest pairings of characters maybe ever brought together. The set was simply the view of the Hudson. It could not have been more gorgeous. The first act attempted to cover Romeo and Juliet, Titus Adronicus, Othello, the twelve comedies and Macbeth. The bonus of the first act was the "histories" being presented as a football game - starring King Richard, John, Henry and Lear with their crown serving as the football. The second act was all Hamlet. On top of it being clever, it was absolutely sidesplitting. Who in the world could imagine characterizations of the king and queen being played by "Jack Nicholson" and "Carol Channing"! All of this hilarity was brilliantly brought together by actors Christopher V. Edwards, Kurt Rhoads and Jason O'Connell. These guys are my my new comedy heros and they are absolutely fearless! It was surprisingly easy getting to the Hudson Valley. The Metro North is easy enough, as I know from my previous trips to nearby Poughkeepsie & Hyde Park, but with the aide of Kari's zipcar the day was all about freedom and could not have been more perfect. I can't wait to make a return visit to a performance of the Hudson Valley Shakespeare Festival.